I've observed for the past couple of months that the Shanghai market had become a giant casino game and were ripe for correction last month. Well, the Chinese markets have gone cliff diving again, falling 20% in a matter of weeks and that leads to the question will they lead the US markets lower or will we shrug it off? "The Shanghai Composite Index, the world’s worst performer in August, may fall another 25 percent as China’s economic recovery isn’t “sustainable,” former Morgan Stanley Asian economist Andy Xie said. “The market is in deep bubble territory,” Xie, 49, who correctly predicted in April 2007 that China’s equities would tumble, said in an interview with Bloomberg Television. " If Chinese growth slows, China will stop boosting the global economy and become a drag. One could argue that if the Chinese government spending party is over, it will reduce their demand for US$ taking the dollar down and pushing up interest rates. This could take years to unfold, but it is possible that it plays out this way. I know I'm guilty of focusing on China too much, but we need to remember that the second largest economy in the world is still Japan's and they are going to go through some substantial upheaval after the DJP's landslide victory in yesterday's elections. Many market observers think that domestic spending will improve prospects for their stock market, but I think there may be more than a few bumps in the road. I've speculated before that Watertown, NY's Craigslist was receiving more postings than Kingston, ON but I had never actually gone through the websites to compare the two before today. Wow - it's not a slight difference. It's staggering. Nearly 20 postings in Watertown on Sunday for every 1 posting in Kingston. Over 600 total "for sale" postings on Sunday in Watertown to just under 30 in Kingston. Kingston has a substantially larger population than Watertown (and is probably about equal to the that of the Jeff/Lewis/St. Lawrence county region) and has a high concentration of university students that have been Craigslist users since the beginning, so why are there so few users relative to Watertown? I Craigslist is wildly popular in Toronto, Montreal, etc., so what gives in Kingston? One of the more popular articles of the weekend comes from the Washington Post re: the banks. Apparently, since many of the big banks were too big to fail last year, the solution has to be.... make the BIGGER!! One of the big questions I struggle with daily is --- where are we going from here? Everywhere I turn the choices look to be hard, unpopular and/or painful in the short-term. In a well designed piece John Mauldin argues that as a country we continue to act like teenagers. We want to take the easy way out and kick the can down the road to deal with the consequences later. This isn't a Republican or Democratic issue, this is a nationwide disease. “A combination of higher official indebtedness and monetization has the potential to yield the worst of all worlds, pushing up long-term rates and generating increased inflation expectations before a convincing return to growth takes hold. An early return to higher long-term rates will crowd out private demand, as lending rates on mortgages and personal and corporate loans rise too. It is unlikely that actual inflation will emerge this year or even next, but inflation expectations as reflected in long-term interest rates could well be rising later in 2010. This would represent a serious threat to economic recovery, which is predicated on the idea that the actual borrowing rates that individuals and businesses pay will remain low for an extended period. Higher rates during a second leg down in 2010 is a double whammy for the US economy. I hope this doesn't happen, but we need to be aware that it is a possibility. Have we grown up? Are there adults in the room? Sadly, I don’t think there are enough. We are still a nation of teenagers. Finally, there was a great deal of talk last week about the run in the zombie banks and financials. Companies that were on life support six months ago, Citigroup, Fannie, Freddie, AIG, etc have seen their stock prices explode recently and there have been a number theories as to why - short covering, etc. However, there is a really interesting set of data that was dug up by TraderFeed that shows an unbelievable surge in the volume of Citi, Fannie and Freddie as a percentage of NYSE volume. Are you really sure you want to run for political office? 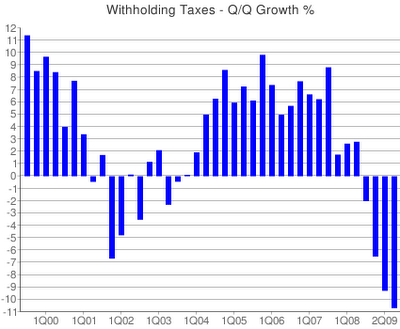 This shows the quarter-to-quarter Federal income tax withholdings. This is a real-time snapshot of employment in the US and the picture isn't pretty. Imagine trying to balance the competing headwinds as a member of Congress --- plummeting revenue, soaring spending, job losses, etc, etc. Lots to cover in a relatively uneventful market (back in the market's heyday, it was always clear that the real money went on vacation on the last two weeks of August - that trend seems to be back this year). In perhaps the most linked to article I've ever seen on financial websites - Doug Kass said today that the market has seen it's high point for 2009. Again, this wouldn't normally be news but Mr. Kass perfectly timed a call in March that a "generational low" was in place and people should buy the market. His new call, coupled with extreme bullish readings could make for some interesting trading in the weeks to come. Zero-Hedge definitely has a negative view of the economy and they use a ton of fancy charts to prove their point. If you're bored it's worth clicking through the 72 page document because they make a pretty compelling argument that things are getting worse not better. I'd add that some really smart, really connected feet on the street keep reporting back the same info. Business is getting worse, not better despite what the stock market seems to be saying. If You Were Laid Off Without Severance, How Long Would your Savings Cover Your Living Expenses? By doing some basic math you can see that 66% of surveyed workers have less than 2 months of savings. As unemployment rises this has potentially devastating implications. Last month ExxonMobil-- which has been publicly skeptical of other biofuels in the past -- invested up to $600 million into a collaborative R&D program with Synthetic Genomics, a startup founded by J. Craig Venter. Venter's previous firm, Celera Genomics, was a key player in sequencing the human genome. Synthetic Genomics is looking at, among other approaches, the use of tweaked metabolic pathways in algae to boost the plant's oil production. The startup received an earlier investment from BP a few years ago, but this one by ExxonMobil has raised eyebrows both for its size and because of the giant's track record. "ExxonMobil has always been like the grinch that stole clean tech," says Udupa. "And then all of a sudden they're investing a lot of money in this one algae company." As a closet data nerd, I can play with google trends all day long. Particularly the charts that compare search volumes for different terms. 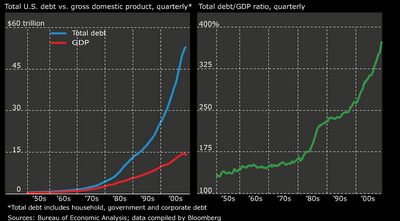 I think this chart truly is worth a 1,000 words when talking about the current crisis. The red line represents the volume of searches on google for "unemployment", while the blue line represents searches for "retirement". It's amazing how closely these lines mirrored one another until early 2008. The divergence has been startling. The owner of this lovely dormitory... I mean single family home has somehow fallen behind on certain payments that are typically made to an entity called the IRS because the high bidder on 9/23/09 will full use of 6 bdrms and 8 1/2 baths (not counting the three bedrooms and three baths in the guest house!!). It's worthwhile to click through to the virtual tour.... The gaudy 2007 over the top nature of this house is unbelievable. I wonder if Jerry Jones owned a place in San Antonio? 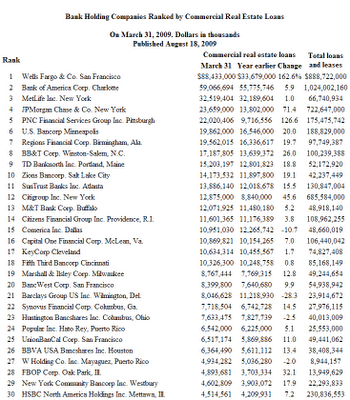 Hat tip to BR at The Big Picture for posting this list of commercial real estate exposure. This is a great list because it shows the serious risk for some banks (Wells Fargo, Metlife, Regions seem to jump off the page), while showing a relatively small commercial loan portfolio for others (Citi and JPMorgan have surprisingly low exposures). One that jumps off the page to me is M&T bank out of Buffalo. Remember all of those new stripmalls that seemed to pop up in Watertown in the last 3 years. I don't know if any of them were financed by M&T but those were the bread and butter loans for M&T over the past 10 years. The head of SunTrust Banks Inc., Georgia’s biggest lender, said U.S. financial institutions probably will report further credit losses as commercial real estate falters through next year. “The industry is a long way from declaring any sort of victory, especially regarding credit issues,” Chief Executive Officer James Wells III said today in a speech to the Rotary Club of Atlanta. 1) One of the lottery jackpots has grown to over $200 million (remember after taxes and present value calculations you're talking about $50 million to the winner if there is only one winner). Please resist the urge to throw your money away. If you really don't like your money put it through a shredder and make some bedding for your pet rabbits. The markets have show surprising strength since Monday based on many fuzzy "indicators" and less bad data releases (even though jobless claims were below expectations today). Volume remains extremely light and bullishness remains disturbingly high - buyer beware. One thing that I think the economists are struggling with is the psychological shift among US consumers, particularly those under the age of 35. There is a growing sentiment among consumers that I don't need another pair of $85 jeans or a $49 hoodie. Younger Americans (at least those that I talk to) seem to be saying "We're pretty happy with what we have and no amount of stimulus or low interest rates is going to get me to spend like a drunken Senator." Now, this isn't true for the Boomers. They keep spending like their money is coated with the H1N1 virus and they want to get rid of it ASAP. However, I think we've seen a significant downshift in our economy that could become permanent. We'll see. The California Public Employees’ Retirement System, the Washington State Investment Board and the Oregon Public Employees’ Retirement Fund -- among the few pension managers to disclose details of their investments -- had recouped just $22.1 billion in cash by the end of 2008 from buyout funds started since 2000, according to data compiled by Bloomberg. That amounts to a shortfall of 59 percent. In total, they haven’t reaped a paper gain from funds formed in the past seven years. * I mentioned last week that I'd report back on my cash for clunkers experience. I'm happy to say that my local dealer (a Honda franchisee) made the process as painless as possible. I'll have to wait 6-8 wks until I can issue my final verdict - when my title is finally delivered from the DMV - but so far my experience has been surprisingly positive. I thought it might be worth while to note that top vehicles that are being purchased under the program. While many people focus on the fact that there are no GM or Chrysler vehicles on this list. It's a worthwhile observation, but what I find really interesting is that almost all of these vehicles are entry level vehicles - Corolla, Civic, Fit, Focus, Elantra, Versa, etc. I think this speaks to the fact that consumers are downsizing even when they are spending. J.D. Power and Associates said that based on data seen thus far, August will see the first 1mm+ unit sales (includes fleet sales) month since last year. They raised their 2009 retail sales estimate by 300,000 vehicles to 8.6mm units but cut their 2010 retail sales estimate by 100,000 to 9.5mm “in light of the expected pull-ahead sales as a result of the CARS program and a flatter than anticipated recovery.” I think even this analysis is a little misleading because all of the cash for clunker sales are pull forward from some date in the future. If you estimate that it cut 100k sales from 2010, then it is likely 2011-2012 sales should be up to 200k below your previous estimates. Update: Cash for clunkers ends on Monday despite only paying out about $148 million so far. The Shanghai stock market's rally (up about 100% from the lows) was a major factor in helping to pull our own stock market up from it's lows in March. But, as more people grow cynical about China's growth prospects post-stimulus their markets have started waving the white flag. "Despite the nearly unprecedented run in the US stock market (the best since 1933 - hmm, wasn't that smack in the middle of the Great Depression?) it pales in comparison to the computerized lotto games going on in Asia. In particular, China's stock market is up about 100% THIS YEAR as investors have rushed back in hoping that their stimulus will lead to a robust recovery. However, one of the best analysts on the Chinese market basically said this week that their market has become little more than a ponzi scheme....."Chinese stock and property markets have bubbled up again. It was fueled by bank lending and inflation fear. 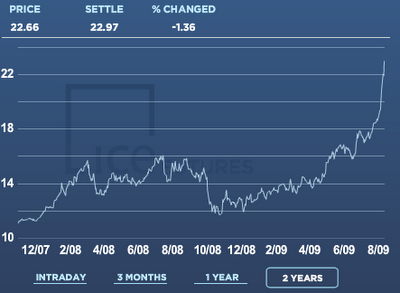 I think that Chinese stocks and properties are 50-100% overvalued." Well, the Shanghai market is now down about 20% in two weeks and shows no signs of turning around. If the Chinese market pulled us up from the depths in March, will they lead us back down? Something to watch. GM to increase production in response to Cash for Clunkers. "This is good news for the 'New GM', the additional 60,000 automobiles will lead to additional shifts and overtime at several factories and the reinstatement of 1,350 workers at two plants. GM said that sales in the month of July and August are between 60,000 and 70,000 units above what the company had predicted as recently as two months ago. In July, the automaker had approximately 300,000 units for sale compared to a peak level of 1.3 million vehicles available at one point in the past four years." The rush of automotive sales activity brought on by the "Cash for Clunkers" program is fading fast, according to Edmunds.com, whose latest study of car buyer behavior indicates that automotive purchase intent is down 31 percent from its peak in late July. "Now that there is plenty of money in the program and the most eager shoppers have already participated, the sense of urgency is gone, and the pace of intent decline is accelerating," observed Edmunds.com CEO Jeremy Anwyl. "Inventories are getting lean and prices are climbing, giving consumers reasons to sit back." Last week, activity was down 15 percent from the late July peak, and Edmunds.com analysts predict that in the coming days, purchase intent will return to levels seen before the launch of Cash for Clunkers." Why do I get the feeling that the production managers at GM are acting like a pizza shop that received an order for 4 pizzas at 9:58pm (two minutes to closing time) so they decided to make 60,000 extra pizzas to account for the spike in demand. I'm not a fan of spreading rumors, but if you watch CNBC at all, you are aware of the balanced, smart, commentary that you will find from Art Cashin. Today's comment seemed to come out of left field - historic trading over the next 8 weeks? Geopolitical event on or around 8/22? Strange. A new survey just published last week shows that the number of homeowners underwater (those that owe more than their house is worth) has soared and it really puts the prospect of any recovery in housing in perspective. properties that were approaching negative equity. Negative equity and near negative equity mortgages combined account for nearly 38 percent of all residential properties with a mortgage nationwide. • The aggregate property value for loans in a negative equity position was $3.4 trillion, which represents the total property value at risk of default. In California, the aggregate value of homes that are in negative equity was $969 billion, followed by Florida ($432 billion), New Jersey ($146 billion), Illinois ($146 billion) and Arizona ($140 billion). Los Angeles had over $310 billion in aggregate property value in a negative equity position, followed by New York ($183 billion), Miami ($152 billion), Washington, DC ($149 billion) and Chicago ($134 billion)." Think about those facts - nearly 40% of US homeowners owe more than their house is worth. Those homeowners are stuck and their banks are stuck - there is no way to unwind this mess short of a massive wave of foreclosures, short sales and/or bank failures (note that banks have continued to fail while the stock market has rallied). Anyone looking at real estate in Florida should be able to get a Detroit style bargain in 5-10 years. The aggregate value of all property in Florida is roughly $981 billion and there is $923 billion in debt against that real estate. That's the sort of debt to equity ratio that an emerging market should have not a major retirement zone in the leading economy in the world. California has almost $2.4 trillion in mortgage debt and 42% of these loans are underwater. What's truly stunning about these statistics is that roughly a 1/3rd of all homeowners nationwide are estimated to have no mortgage. So when you consider Florida for example, roughly $320 billion worth of homes are paid for and $660 billion worth of homes are levered with $920 billion worth of debt. Staggering. This chart is quite scary. I knew this data existed, but I have not seen someone put it together before the St. Louis Fed put out this chart. This shows the average length of time it takes for an unemployed person to find a new job. Every recession in the last 50 years has peaked at 15-20 weeks for the average length of time it takes to find a new job. 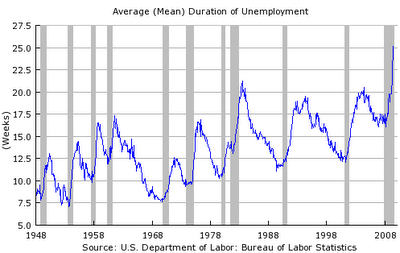 Now, we're in uncharted territory with it taking 25+weeks for the average unemployed person to find a job. Ever the contrarian, I noted last week the frothy happy headlines that had started to emerge - The recession is over, The bull market is back, etc., etc. The daily sentiment indicator among active traders has been up around 85% to 88% levels last recorded in October 2007 (the market peaked in October 2007). Think about how dramatically the economy has changed in the last 2 years, but the sentiment of traders is effectively the same as it was when the down was over 14,000? The disconnect between the markets and reality may be at an all-time high. All other sentiment indicators (AAII of individual investors, ISE sentiment index, etc) are hitting peak levels not seen in 2-3 years. These indicators tend to be pretty accurate contrarian indicators and while a single day does not make a trend, today's market action was disappointing to the bulls because it really broke through a number of key levels. The Asian markets are bouncing back right now in early trading so we'll see how it plays out tomorrow. "More than 150 publicly traded U.S. lenders own nonperforming loans that equal 5 percent or more of their holdings, a level that former regulators say can wipe out a bank’s equity and threaten its survival. The number of banks exceeding the threshold more than doubled in the year through June, according to data compiled by Bloomberg, as real estate and credit-card defaults surged." FYI - if you happen to be one of the many consumers looking to close a cash for clunker deal, be aware that many dealers are asking buyers to sign contingency forms that put you on the hook for $3,500 or $4,500 if the dealer doesn't get his rebate for any reason - whether you or the dealer is at fault. "The U.S. Department of Transportation is advising consumers taking advantage of the “Cash for Clunkers” program not to sign contingency agreements promising to pay back up to $4,500 if dealers don’t receive payment from the government. No contingency agreement is required to participate, the Transportation Department, which administers the $3 billion Car Allowance Rebate System, said on its Web site. The Minnesota Automobile Dealers Association has a form on its Web site that members can use as part of a new-car closing. By signing the form, the buyer agrees to reimburse the dealership the incentive amount if the dealer is unable to obtain the credit from the government “for any reason.” The consumer can also return the car to the dealership and pay “a reasonable charge” for use of the new vehicle, according to the form." I'll keep you updated if my local dealer tries to pull something like this tomorrow. Perhaps the most famous market call in the past 9 mths was Doug Kass' call to cover shorts and get long in Mar 2009. Mr. Kass had been a famous bear and this was cheered by many as a reason to buy, buy, buy!!! His call (and Citigroup's famous - we've been profitable for a couple of months - press release) really lit the fuse under the market that led to a 40% 5 mth run. 9. Municipalities have historically provided economic stability — no more. 10. Federal, state and local taxes will be rising as the deficit must eventually be funded, and high-tax health and energy bills also loom. His prior call was more of a trading position - things were oversold and were due to bounce - this message today speaks to all of the fundamental flaws with our domestic economy and how none of them will be solved with quick fixes. I'm not sure it moves the market today or tomorrow, but with two leading forecasters predicting a return of the bear market it's worth watching closely. I'm always the skeptic and I find it extremely convenient that the EPA changed it's fuel mileage measurements for electric vehicles after GM was effectively rescued by the government. However, since GM has been given the greenlight on the Volt expect to see a ton of advertising around this new number in 2010-11 ---- 230 Miles Per Gallon!!!! "The biggest bombshell is Henderson's announcement that the "230" marketing campaign floating around for the past week is related to the 2011 Chevrolet Volt. The EPA has released a new methodology for determining a draft fuel economy standard for extended-range EVs like the Volt, and under this new procedure, the Volt will have a composite urban fuel economy rating of 230 mpg! On the electric side, the Volt will consume 25 kW/hours per 100 miles. That makes the Volt the first car ever to get a triple digit fuel economy rating." This is only city mileage but it's sure to get plenty of attention. On a related subject - Tesla turned a profit in July! "Silicon Valley electronic car darling Tesla Motors banked a profit of $1 million in July, based on $20 million in revenues brought in through delivery of 109 of its $109,000 sports cars. I had the rare chance to drive a Tesla and can say that if I had a spare six-figure inheritance in my possession, I might well have coughed up for one of these beauties. The earnings this quarter could put to rest critics' claims that the company would never break out of the red. The Tesla Roadster is the only electric vehicle for sale that can travel more than 200 miles per charge, a key selling point to American consumers who don't like the idea of stepping out on dinky battery coverage. The Tesla is also greased lightning, with whiplash--inducing acceleration 0-to-60mph in 4 seconds. That bests almost all other high-end production sports cars by a comfortable margin." It's a little misleading because they recognized revenue on the delivery of the cars in July but incurred costs for many years prior to delivery. However, Tesla's the real deal and when they get production cost down they might own the auto industry. I've noted with some disgust the power of the chart readers in moving the markets. Last Friday the technicians noted that the markets had hit resistance and failed to break through again. Today the grand poobah of technicians head of Elliot Wave International said that we're on the verge of the next big move and that move is going to be down. In February, he correctly timed a rally in the stock market and accurately predicted a move of about 40%. His current prediction is that he is "quite sure the next wave down is going to be larger than what we've already experienced," and take major averages well below their March 2009 lows." If true, this would mean another 40-50% decline in the stock market. I don't see any direct cause for such a move but the technicians' predictions can be self-fulfilling. Yesterday I made reference to Japan's lost two decades (which is more like a lost 2 1/2 decades now). Another quick thought on Cash for Clunkers. At some point this burst of business is going to start crimping business for dealers unless the rebates start flowing to the dealers. For example, if a dealer takes 25 deposits and moves these cars to the back of the lot pending rebates, his total inventory is cut in half. Does he rush out and reorder expecting the Cash for clunker money to come in? Or does he sit on his hands with limited inventory until he's sure the government's check will clear? I have a sense that there may be a little of both going on (depending on the dealers' financial health) and this may create some significant lumpiness in auto sales in the coming months. 1) The rate of unemployment is calculated by taking the number of unemployed persons and dividing it by the number of people in the workforce. Using simple numbers if 2 people are unemployed in a country of 10 people, the unemployment rate is 2 divided by 10 or 20%. Now if one of the unemployed leaves the workforce (retires, stops looking for work, etc) watch the magic of math CUT our unemployment rate --- now 1 out of 9 people are unemployed and the rate of unemployment is now just 11%. Wow, that's a 9% decline!!! Green shoots for everyone!!! Hmmm, but somethings not right with that. Both of our hypothetical employees are still unemployed we just changed the numerator and denominator in our equation but the reality hasn't changed for workers. This is what happened in the US last month - a little over 400,000 workers were removed from the survey - thus while the number of unemployed actually rose the rate of unemployment fell because the total population of workers fell as well. 2) The second factor at play here deals with historical seasonality and the auto industry. Historically, the auto industry suffers substantial layoffs in July as factories shutdown to retool for new model. The BLS has built a seasonal factor into its models to correct for this planned shutdown. However, in 2009, many of the auto layoffs occurred in May due to the automakers many financial issues. When the BLS adjusted for expected layoffs that didn't occur it created a false impression of job "creation" in July. I'd expect this to be fixed in the August report. As I've noted, the unemployment report is perhaps the most flawed set of data the government publishes. It is fraught with estimates and assumptions that rarely meet up with reality. This is a positive data point (there were several other small positive indicators - hours worked, hourly earnings, etc) but it's too early to call this a turning point. In another jobs related subject, the NY Times points out that after 10 years the US has created basically no new non-government jobs. "For the first time since the Depression, the American economy has added virtually no jobs in the private sector over a 10-year period. The total number of jobs has grown a bit, but that is only because of government hiring. For the decade, there was a net gain of 121,000 private sector jobs, according to the survey of employers conducted each month by the Bureau of Labor Statistics. In an economy with 109 million such jobs, that indicated an annual growth rate for the 10 years of 0.01 percent. Health care jobs continued to grow, particularly jobs that involve caring for the elderly. Home health care employment rose at an annual rate of 5 percent, a rate that indicates a total gain of more than 60 percent. On an annual basis, that was twice the overall rate for health care of 2.4 percent a year. You will hear a pretty consistent refrain from many optimists in the coming months - the recession has ended and the recovery has begun! Let's talk about these facts for a moment. The National Bureau of Economic Research officially labels recessions based on GDP reports. As of the second quarter, GDP was still contracting but the rate of decline has slowed meaningfully thanks to substantial increases in government spending (excluding government spending the second quarter GDP decline was essentially flat vs the first quarter). As a result of further stimulus spending and the cash-for-clunkers program it is safe to assume that the economy will "grow" again by the second half of 2009. However, most of this growth is essentially like training wheels on a 3 year-old's bike. When the stimulus programs stop will there be sufficient activity from the private sector to maintain the growth story or will we slide back into recession? What type of recovery do you expect? Almost all of our recent experience with recessions have ended with sharp V shaped recoveries. Unfortunately, recent history tends to have a greater weight when people make their forecasts and thus, many expect a sharp recovery once we turn the corner. I'm not in that camp. I think we have about an equal probability of an L or W shaped "recovery". In an L shaped recovery growth would remain muted and we would remain stuck with an economy that is bouncing along the bottom - not getting worse, but certainly not getting much better. The W shaped recovery would be the most painful and also the hardest to predict. Under this scenario we would oscillate in and out of recession for the next 5-10 years. Given that the vast majority of companies are still cutting costs and not forecasting any improvement in their revenue line I think this is a real possibility. 1) The continued decline of the US dollar. On a basic level, the stock market is a commodity index just like oil or gold. The decline in the value of the dollar means that it takes more dollars to buy assets like oil or gold or stocks. Eventually, this connection starts to breakdown between stocks and US dollar moves, but I think it's played a role in the move over the past 3 weeks. 2) The stock market has really lost it's ability to be a forecaster of economic activity. The stock markets focus on near-term moves and the huge computer trading operations have turned the stock market into an economic generator rather than an economic predictor. One final note on some data that will be coming out soon - unemployment. There are currently 2.6 million people receiving unemployment benefits beyond the normal maximum 26 week period. These people or the "extendees" as they've been labeled, have struggled to find new work in the economy. The number of extendees has jumped from just 100k a year ago to more than 2.6 million in a year. While that number is daunting, consider that without another round of benefit extensions (there are talks to extend benefits) up to 1.5 million "extendees" will be come "exhaustees" as they exhaust the last of their unemployment benefits. So while we could theoretically see a drop in the number of "unemployed" persons in coming months, much of the drop could be a result of people just dropping out of the system as their benefits are used up.